Taliban fighters said Tuesday that the teenage Pakistani activist their gunmen severely wounded last week was targeted because she opposed the group and admired President Obama, not because she supported girls' education, according to a Reuters report. The attack on 14-year-old Malala Yousufzai as she was returning home from school in Pakistan's northwest has horrified people across the South Asian country and abroad. The Pakistani Taliban told the Reuters news agency in a statement that they considered Malala a "spy of the West" and that she deserved to die because "infidels gave her awards and rewards" for "espionage." "We targeted her because she would speak against the Taliban while sitting with shameless strangers and idealized the biggest enemy of Islam, Barack Obama," the statement said. Malala gained wide recognition for promoting girls' education and criticizing the militant group's behavior when they took over the scenic Swat Valley where she lived. The Taliban told Reuters her advocacy for girls' education wasn't why she was targeted. "We did not attack her for raising voice for education," they said. "We targeted her for opposing mujahedeen (holy warriors) and their war." Malala arrived in the United Kingdom on Monday for more specialized medical care and to protect her from follow-up attacks threatened by the militants. At Queen Elizabeth Hospital in Birmingham, where Malala is recovering, police said they questioned two people claiming to be the girl's relatives, raising fears about the girl's security. Medical Director Dave Rosser stressed Tuesday that security was "under control." He said several individuals had turned up at the hospital -- but didn't get very far. While he said the people were arrested, police said they had merely been questioned. Two of Malala's classmates were also wounded in the attack and are receiving treatment in Pakistan. Police told CBS News correspondent Elizabeth Palmer that, although the attack happened on a relatively busy road, no witnesses have come forward. On a brighter note, Palmer reports, the school that Malala championed so passionately is full. All the girl students have come to school and told Palmer that they and their parents -- even though they've been frightened by the attack -- are refusing to be intimidated. 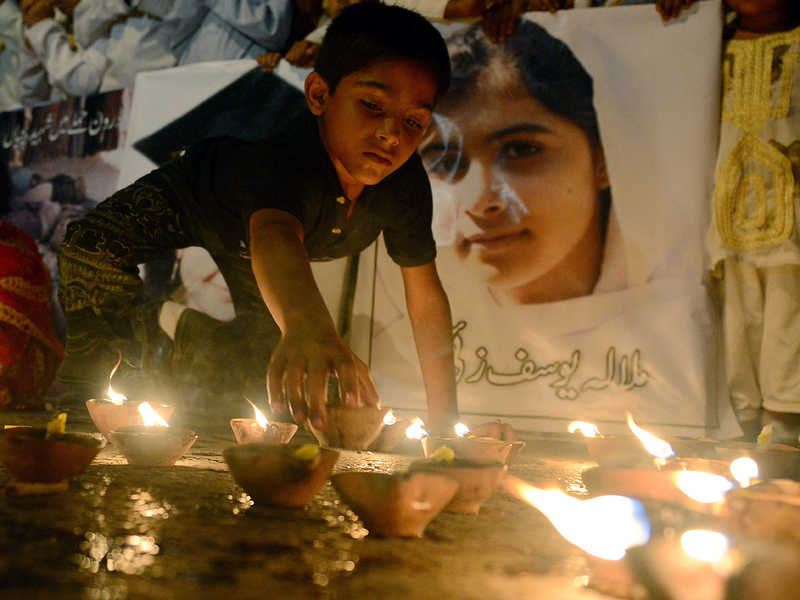 Malala had been receiving treatment at a Pakistani military hospital. Pakistani doctors there removed a bullet from her body that entered her head and headed toward her spine. The Pakistani military has described her recovery as satisfactory and said she was able to move her legs and hands several days ago when her sedatives were reduced. It has not said whether she suffered any brain damage or other permanent damage. The military also said damaged bones in Malala's skull will need to be repaired or replaced, and she will need "intensive neuro rehabilitation." The decision to send the girl abroad was taken in consultation with her family, and the Pakistani government will pay for her treatment.